Centaur Interiors capitalized on an amazing opportunity in Chicago’s West Suburbs to create a vision for their client in the 2,500 square foot lower level space of his home. 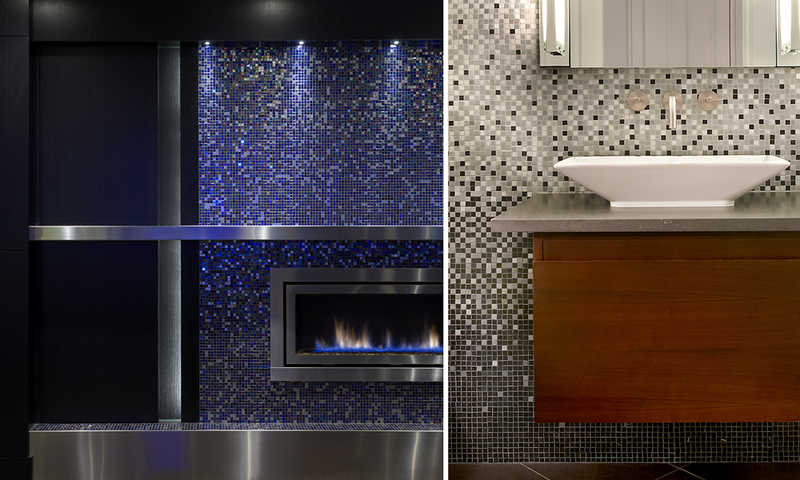 What started as a custom spa rapidly emerged into a complete transformation. The design met the client’s passion to entertain and coupled it with an urben spa oasis retreat. Director Mike Miller and his team outstandingly combined these two facets and the result was clean urban sophistication at its finest. Modern clean lines are consistent in each area and an extreme level of detail exists in all aspects of the space. An eternity spa built 10 feet into the existing floor, is complete with an LCD television, waterfall, and a custom architectural domed fiber optic ceiling which mirrors a starry night. The spa area is secluded by smart privacy glass recessed into channels in the floor and ceiling. Interiors utilized the latest DTV II Steam Shower from Kohler in the steam room and the “wet and dry” powder rooms were designed with floating soffits, stone vanity walls, and automated indirect lighting, all providing a state of the art spa retreat. The entertainment area is opposite the spa oasis in almost every aspect. Three steps out of the spa room, a semi-circle bar leads the way into an open seating area, complete with large leather recliners and chaise lounges. These all face a floating fireplace and modern ebony millwork mantle the length of the room with brilliant mosaic glass tiles enclosing the actual fireplace. 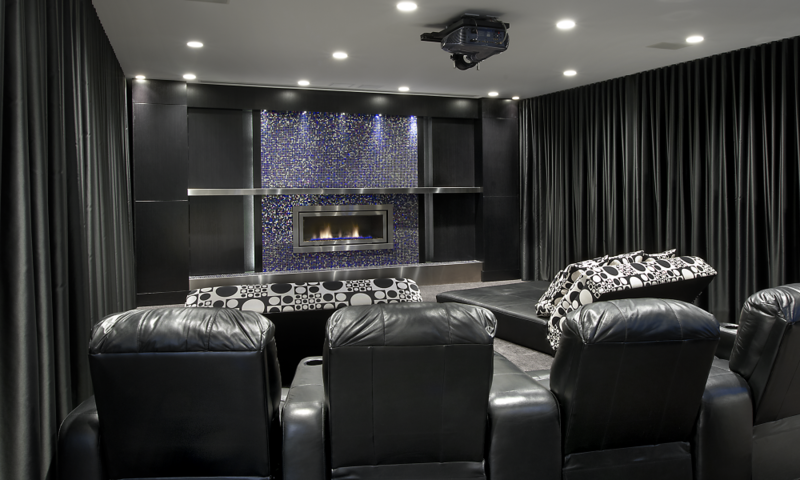 A home theater, with remote curtains, are automated when in movie mode. 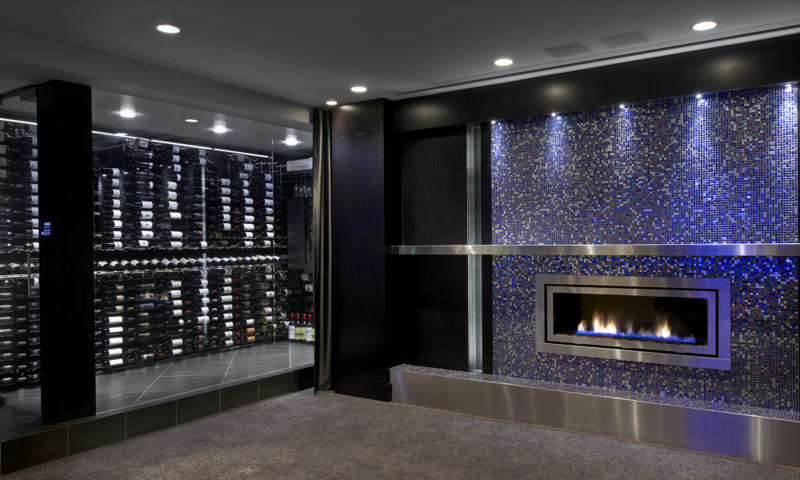 The client’s custom wine cellar, enclosed in glass, has a magnetic keyless lock, and is an amazing addition to the corner of the theater space. The entire space suites the client’s needs perfectly, having an ecclectic area to entertain guests, in addition to the quiet serenity of a spa oasis, both at his fingertips.